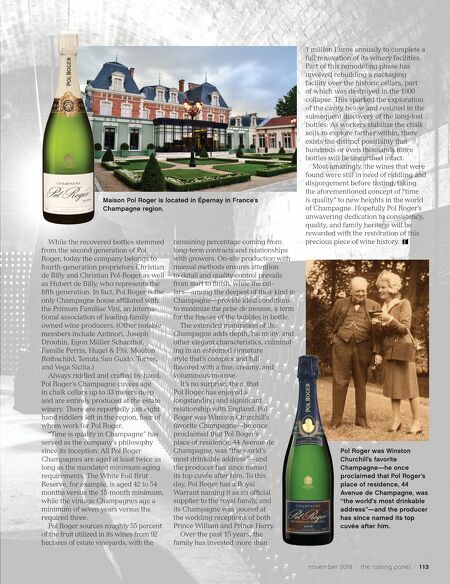 1 12 / the tasting panel / november 2018 SPARKLING WINE A t 2 o'clock in the morning on February 23, 1900, a dull rumble akin to the sound of thunder awoke Maurice Roger of producer Pol Roger—named for his father, its founder—and his chef de cave. Two hours later, they discovered that a portion of their immense chalk cellars had fallen prey to the cold dampness of winter, collapsing inward and bury- ing 500 casks of wine and 1.5 million bottles in the process. Despite attempts to mitigate additional losses, another collapse occurred a month later, and all efforts to tunnel into the rubble were abandoned. Yet on January 15, 2018— almost 118 years after the collapse of the estate's chalk cellar—27 historic bottles of Pol Roger Champagne from vintages possibly as old as 1887 to 1898 were found intact. Their recov- ery is a dramatic development, to be sure, but perhaps equally noteworthy is the unbroken legacy of Pol Roger that's encased in every bottling produced since those lost years. 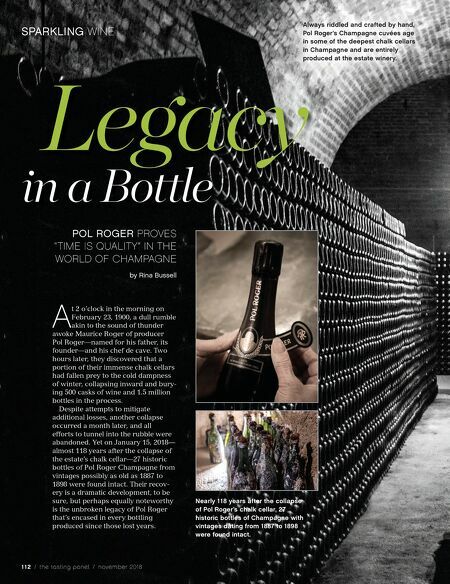 Legacy in a Bole POL ROGER PROVES "TIME IS QUALITY" IN THE WORLD OF CHAMPAGNE by Rina Bussell Nearly 118 years after the collapse of Pol Roger's chalk cellar, 27 historic bottles of Champagne with vintages dating from 1887 to 1898 were found intact. Always riddled and crafted by hand, Pol Roger's Champagne cuvées age in some of the deepest chalk cellars in Champagne and are entirely produced at the estate winery.